Four-year- old Eli woke up bright and early every morning that week. “Are we going to see the owls today, Mommy?” My little nature lover was completely obsessed with the thought of seeing a real live owl. Turns out, the daily countdown we started that first morning was worth it. There was even more in store for Eli, and lots of other boys and girls and their caregivers, last month at the – where? The nature center? A county park? Our awesome local zoo? Nope, we were at the local Chester library. Children oohed and a ahed as they observed the animals, touched actual snake skins, and listened to the handlers tell exciting tales about creatures these kids had never seen before. My two boys, Eli and six-year-old Brady, and I spent that exciting Saturday morning taking in Animals of the Night, a program sponsored by AWARE (The Alliance of Wild Animal Rehabilitators and Educators). And afterwards, what did we do? We reviewed the titles the librarians had conveniently laid out for us, and checked out books on nocturnal animals, of course. I have to admit, it was tough convincing Eli that he needed to keep his voice down in the library after the animal presentation, but it was all part of the experience. If you think this kind of stuff is just for the residents of the bustling metropolis of Chester, think again. Public libraries all over Greater Richmond work diligently to provide programs like these to lure kids and their families to the library. Story time, for example, is one of Chesterfield County Public Libraries’ (CCPL) most time-honored traditions and a real crowd pleaser. Twice a week, at all nine CCPL branches, experienced children’s librarians read engaging stories, sing educational songs, and help enhance preschoolers’ reading preparation. Many branches offer bilingual story times for Spanish-speaking families and other folks interested in honing their world language skills. Henrico County Public Libraries (HCPL) also offer story time, as well as a separate family craft time, at its nine county branches. Weeknight story times and Saturday morning programs have also been added for working parents and their kids. After story time, parents can check out special read-to-me kits from the library to help reenact the story time experience. Carolyn Garner of the Pamunkey Regional Public Library system, which serves residents of Hanover, King William, King and Queen, and Goochland Counties, adds that story time is popular all over town. Mother Goose story time, she notes, is a mainstay for caregivers with babies as young as six months. But the library is not just for families with small children. Kids and their families are invited to a variety of free events, ranging from Lego-building competitions to exotic animal showings to concerts. “One of the best things about programs at the Pamunkey Regional libraries is that they are free and open to everyone,” says Garner. “So they’re an excellent value for families of all sizes.” Magic shows are also quite popular at many of the region’s libraries. My older son and nephew were wowed by a magic show last summer at the library that included a real live bunny. Perhaps, not as awe-inspiring as the owls, but these two still talk about that bunny when they get together. Library systems offer summer reading programs to help encourage active literacy participation through those long school-free months where reading isn’t always a first priority. Pat Muller, youth services coordinator for HCPL, says reading promotion programs like these run from the toddler to adult years, and this summer they come with an awesome reward. “Last year our grand prize for each level was an iPad,” says Muller who has vowed not to reveal this year’s reading incentive yet. Alex Seely is a reading specialist at Elizabeth Scott Elementary School in Chesterfield County. She advises parents all the time to take their children to the library over the summer break. “Research has repeatedly shown that children who continue to read over the summer perform better in the fall when school resumes. Students can often lose from 30 to 40 percent of what they have learned when they are not actively reading,” says Seely. So you’ve got teens on the lookout for recreation? Well, libraries provide a safe environment for teens where they can meet up with friends, surf the Internet, participate in study groups, and discuss popular books. CCPL offers video-gaming opportunities for teens, as well as art classes and writing workshops. 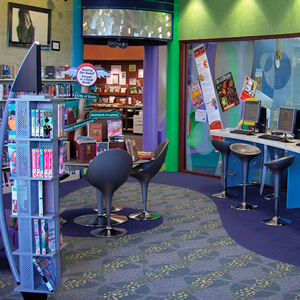 The HCPL Teen Advisory Board at each branch is for grades seven through twelve. “Teens are able to join and help us plan library events for teens, earn community service through a variety of activities, and assist at children’s events,” says Muller with HCPL. “We have had babysitting and creative journaling programs for teens. This summer we are adding a new program category for tweens.” Muller mentioned programs with names like Crime Scene Investigation, cartooning, and Street Smart After Dark. Toddlers, kids, and adults can all benefit from time spent at the library. And while I still visit every week to pick up the books on my wait list, I also know we can borrow DVDs, traditional format audio books, and the new Play away digital audio book. Available at many local libraries, Play away is the all-in-one audio book that’s a self contained unit. You borrow the Play away and supply your own headphones and one AAA battery. There’s also a digital library. Yes, even though I am, and always will be, a book person, like many readers today, I own an eReader. Both CCPL and HCPL have not only an extensive selection of downloadable titles, but also the training resources to talk you through the process of downloading books to your iPad, Nook, or Kindle. HCPL offers training over the phone and CCPL has instituted a “personal librarian” program for individuals who need help with technology or answers to other questions regarding the library. The best part of all of this? It’s free. The experts at local libraries all over greater Richmond are committed to bringing people into their book-filled havens for education and recreation. Once you go, you’ll want to stay awhile-especially with so much to see and do. I just need to figure out how to get Eli to whisper while we are there. Previous articleIs It Summertime Already?